The restaurant inhabits the corner of a striking modern pastiche of an Art Deco cinema building with unrivalled views over the English Channel and, in the foreground, a rocky garden – home to Ventnor’s famous wall lizards. Inside can be seen a rather curiously-shaped venue filling the space underneath all those nice new flats. The décor is very determinedly 1930s in style, in sympathy with the building itself. Taking refuge from the blustery weather, M and C entered the foyer and were immediately greeted by the most enthusiastic waiter that side of Hambrough Road. The poor chap fell on them like he had just emerged from a thousand-year coma and was rediscovering the use of his atrophied tongue. They were the first customers of the evening for him, but my, he seemed to be in a rush to get an entire day’s-worth of small talk out before the diners had even taken their coats off. He was also full of extraordinary and grandiose promises about the great meal Matt and Cat were about to eat. Were they hollow words or based on substance? Offered the best seat in the house – and that’s a pretty good seat in this place – with views over exhausted but persistent surfers bobbing in the foamy sea, Matt and Cat sat down and took the proffered menus. The tables bore fresh flowers but nothing else, so the waiter hurried backward and forward with pitchers of water, cutlery and many more promises. “If you don’t like the food, don’t eat it. Whatever you leave on your plate you won’t have to pay for. I promise this will be a great meal. It’s all fresh. None of it frozen. The chef comes from the Royal. He’s really good”. And on it went, an almost uninterrupted stream of consciousness. A sharp contrast from Ventnor’s famously taciturn serving lady who could almost be seen far below plying her indifferent trade at the Spyglass. There was a good range of food on the menu – chicken, steak, salmon and veal with a single option of mushroom risotto for the vegetarians. Unusually the menu, although short, had some repetition in it: for example one could order not only “Duck Breast with Blackcurrant & Port Sauce Served with New Potatoes & Seasonal Vegetables” but also the strangely familiar “Filet of Lamb with Port & Blackcurrant Sauce Served with New Potatoes & Seasonal Vegetables“. Matt, having burnt off loads of calories fighting against wind, was keen to replenish so he ordered a starter as well as a main course. Cat sipped on the iced water. After the starter was ordered for Matt alone the waiter perhaps felt upset by the asymmetry, as back he bobbed with a further menu of aperitifs. It was unorthodox to be offered them at this stage but, as none of the food had yet arrived, Cat gamely said she’d have olives and feta. Matt’s starter turned up and very nice it looked. 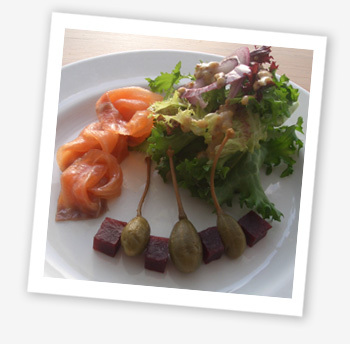 Described as an ‘assortment’ of smoked fish, there were only two types: smoked mackerel and salmon. This led to a debate about whether two items count as an assortment. A choice perhaps. Definitely a brace. The mackerel was splendid; thinly sliced and not at all bony, just tender meat. The smoked salmon was generic but not unpleasant. This dish was a little better than the very similar starter recently eaten at the Waterfront, as the salad was dressed with oil and balsamic vinegar; simple but pleasant. Where it fell down in the same comparison was the price – £5.95 in Ventnor far outstripped the modest £4.25 in Totland. By now Cat’s olives and feta had arrived in the tiniest of ramekins. It’s rude to count but, suffice to say if there were a dozen olives it would have been a surprise. Then piping hot rolls arrived. M and C hadn’t ordered them, but they ate them up without protest (and later found them on the bill). By then the restaurant had more patrons and the waiter was keen to share the love, leaving Matt and Cat for a few precious moments to their own private conversation and some surreptitious photography. Before any time at all the loquacious server, who proved to be the proprietor, was back to clear away the starters. With little – or, actually, no – prompting from his charges he told them all about how he had taken out a mortgage to buy the place, but never advertised as it was a waste of money. Nodding and smiling, nodding and smiling, Matt and Cat gave him their best fixed grins. They were delighted when the main courses arrived and they were left to eat them, with more grandiloquent superlatives floating on the air. The main meals were very similarly presented – surprisingly so, in fact. Matt had ordered sirloin steak with sauté potatoes and stir-fried vegetables. A square platter appeared before him which fitted the bill very well. The steak was heavily peppered, which Matt is partial to. Still, not everyone likes so much pepper and he did wonder if this should have been optional, or at least indicated on the menu. But that aside he was more than pleased with the dish. The steak was done to a turn and delightfully tender. The stir-fried veg was a curious accompaniment, but not unwelcome. However, once Cat’s dinner was examined it became apparent that, apart from the main ingredient, it was pretty much the same as Matt’s. Having decided not to have the Cajun chicken because it was accompanied by (in her view) inappropriate stir-fried vegetables, Cat was surprised to find that what was supposed to be Duck Breast with Blackcurrant & Port Sauce Served with New Potatoes & Seasonal Vegetables was in fact served with sauté potatoes and stir-fried vegetables, just like the other meal. Matt and Cat’s faulty memory of the menu led them to imagine that they’d simply misremembered. But later, on studying the menu outside, they realised this mistake. If they’d spotted this in the restaurant then Cat might have considered sending it back – not because the food was at fault but simply because it wasn’t what was ordered. However, this may have incurred far more dialogue with the waiter than could be endured. As it was she pretty soon came to the conclusion that stir-fried vegetables were not an appropriate accompaniment for what was a very nice breast of duck. Seasonal veg would have been a lot better. Now, it was a good meal and she ate it with pleasure; but it was neither accurately made nor well-conceived. Another change of course, another surreal interaction with the one-man cabaret that was the waiter. This time he expounded volubly on the music nights. Every now and again, it appears, he puts on music played by a very famous local musician. Little was said of the music itself, but the diners were advised conspiratorially that this musician is very fond of chicken. In fact, there he was! The maestro had arrived for his nightly bird, but before he even got his coat off was hauled over to shake hands sheepishly with a slightly embarrassed Matt and Cat. Nobody really had any idea what was going on by that stage. It was starting to be a memorable and entertaining meal – although not in the way M & C had expected. The music man retreated to a distant corner where he huddled over a plate, and once more Matt and Cat were able to give some attention to the excellent food. Dessert for Cat was Irish liqueur cheesecake. Matt had strawberry and champagne basket. Now the waiter had several times assured the diners that it was all fresh, and as far as quality was concerned there was no reason to disbelieve him. But the dessert menu was certainly inspired by the frozen delights available from Messrs Vittles of Leicestershire. Both the choices M & C made are there on the Vittles website, available in packs of 128, alongside the other desserts on the menu. Still, probably just coincidence. The desserts were eaten with pleasure – they were actually pretty good. Finally, the time came when Matt and Cat decided to brave the tempest and make their way back up the zig-zagging streets of Ventnor. But, mysteriously, for the first time in the evening the merry waiter was nowhere to be found. They waited patiently, watching the gathering gloom over the English Channel, until eventually it was necessary to sally forth to find the fellow. Matt had hardly risen from his seat before the reason for the interruption in service became apparent. The patron was sitting eating chicken with the maestro off in the corner. Now here was an interesting challenge for those keen on the correct etiquette. To march across a restaurant and disturb a man’s supper would be the height of bad manners. But when that man is the only member of staff in the restaurant, what is the courteous diner to do? A few moments of puzzled and impotent English stiff upper lip later, and the issue was abruptly resolved when the chap spotted his charges peering anxiously across the room. To his credit, he leapt to his feet and saw them off the premises with the utmost courtesy. M & C stood on the pavement, dazed and highly entertained. It wouldn’t be at all fair to say they were jaded by over 250 reviews in three years, but it certainly would be no exaggeration to suggest regular eating out means that an out-of-the-ordinary meal is a novelty they are able to take pleasure in. Now if you were coming here looking for a sophisticated and classic restaurant – which is what the Rex appears to be on the outside, and is reflected in the fairly high prices – you might be taken aback by the idiosyncratic service and slightly erratic kitchen. If, on the other hand, you are game for a meal you won’t forget, then Matt and Cat can recommend the Rex Piano Bar as a place they will recall with pleasure for many years to come. Was really looking forward to our meal here but dissapointed with the evening, starter £7.25 for duck breast with orange and truffle, actually got cold duck with rocket and sundried tomatoes. At start of eveNing asked for Pinot Grigio off menu £16 per bottle, owner suggested trying a different piniot which was not yet on the menu, but failed to inform us that it was £6 more than the pinot we asked for. Steak main was £17.95 but we got a steak with four button mushrooms, nothing else, apparently usually they serve some typE of potatoe and vegetables with it, obviously couldn’t be bothered that evening. Service was lovely the lady waitress looked after us well. Just shame about the mis-selling, I feel slighlty conned. A visiting friend and i were looking for a cup of tea and a cake on new years dy afternoon and finding now where else in town open we walked through the doors of the rex at 3.15pm. We were neither acknowledged nor approached by man behind the counter , we were rudely oggled at by all 3 of the other people sitting in the bar though,. We sat for a couple of minutes when the man came over and asked us what he could get us. My friend asked for tea for us both and enquired if they could provide a scone or something of that nature. He said we could have some fruit cake , which neither of us fancied so we just asked for tea. At that point he informed us that the Rex closes at 3pm and then in a begrduging tone he could probably manage to get us cup of Tea and ” take it from there” ????? If they were closedthen why did he let us come in the first place?? I suspect that if we had ordered more than tea he might of been less begrudging. Sally Taylor…How was your meal last year? Great location. Great building. Great decor. Attentive service. Our first visit for lunch was excellent. Retunring with a friend (because it was so, so good) we were hugely disappointed. Slow, slow, slow. My wife has diabetes and needs carbohydrate on time relative to her injections. She resorted to mouthfuls of sugar to stop from passing out. Not good. I know this is off topic regarding the Rex, but I got the afforementioned lady in the Spy Glass to laugh on Saturday – how about that?! Had to leave a comment after reading what you’d wrote about the miserable old cod in the Spyglass! What is it with her? So many people I know have eaten there before, and all have had an experience to forget with this lady. I thought there was available medication for women of a certain age and dispersition! Back to Rex’s piano bar, after reading your review I cant wait to go there for my anniversary meal. I stumbled across this place on Wednesday, it seems they have a new Chef that is rolling out a new menu on Saturday night, the guy gave me and my friend a preview and a few tasters that he was serving up to some people that were there, he makes hand made breads and stuff, the olive bread was fantastic, i have booked in for saturday, it might be worth anyone that has already been there doing a revisit, judging by the samples I had on Wednesday the weekend should be good, the funny waiter guy was telling everyone about thier new website too, http://www.rexpianobar.co.uk I checked it out, looks nice. i’ve not eaten here – but at least he sounds keen! Sounds desperate for custom… its a shame really. it does always look ever so quiet when i walk by- perhaps these are the wrong prices during a recession… one reason i’ve not been in there i’m afraid! This has to be one of the blandest eateries on the Island. The food,decor and the owner is most irritating. As for chef beibg from the Royal They’re well rid of him. Matt responds: you might not be surprised to learn that I didn’t write that bit! Been staying in Ventnor for a few weeks and decided to try the Rex piano bar.I’ve eaten at places all over the world and have to say this place is in the botom three.From the decor which is bland to say the least to the food this place is just horrible. Nice views though.